It’s estimated that some 65% of children entering primary schools today will likely work in roles that don’t currently exist . We expect the pace of change in the job market to start to accelerate by 2020. Office and administrative functions, along with manufacturing and production roles, will see dramatic declines accounting for over six million roles over the next four years . Conversely, business and financial operations along with computer and mathematical functions will see steep rises. When the World Economic Forum surveyed global HR decision-makers, some 44% pointed to new technologies enabling remote working, co-working space and teleconferencing as the principal driver of change . Concurrently, advances in mobile and cloud technology allowing remote and instant access were singled out as the most important technological driver of change, enabling the rapid spread of internet-based service models. 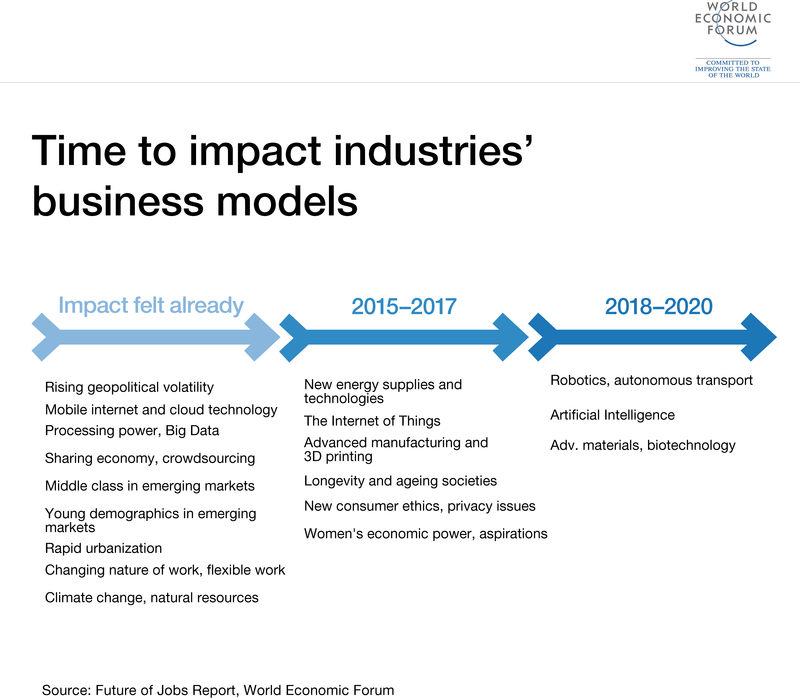 Technology underpinning what futurologists have christened ‘The Fourth Industrial Revolution’ will enable disruptive business models to decentralise our economies as we move from value systems based on ownership to ones enabling access. Personally owned assets, from cars to spare bedrooms, will expand entrepreneurship, diversifying revenue streams. It’s no fluke that within three years of trading, home-sharing platform Airbnb offers more rooms than some of the biggest hotel chains . These disruptive business models will fundamentally reshape how we do business, both individually and as companies. For example, digitally enabling smallholder farmers can allow them to operate as a collective, transferring knowledge and sharing vital learnings with each other from proper crop irrigation technology to water efficiency. Cloud-based analytics hosted on BT’s Expedite platform can assist in radically transforming such supply chains . The Future of Jobs report is available here .